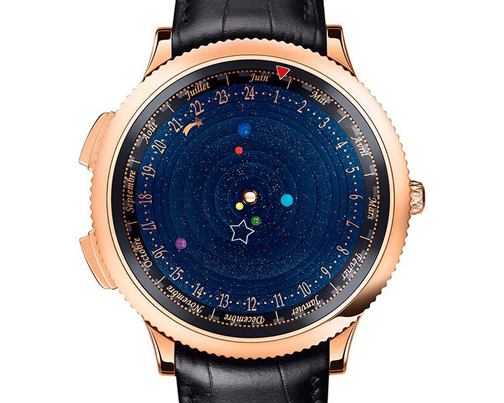 Van Cleef & Arpels Midnight Planetarium on the wrist. Its been an incredible week of astronomical watches, but now we bring you the piece de resistance: the enchanting Van Cleef & Arpels Poetic Astronomy™ watch. 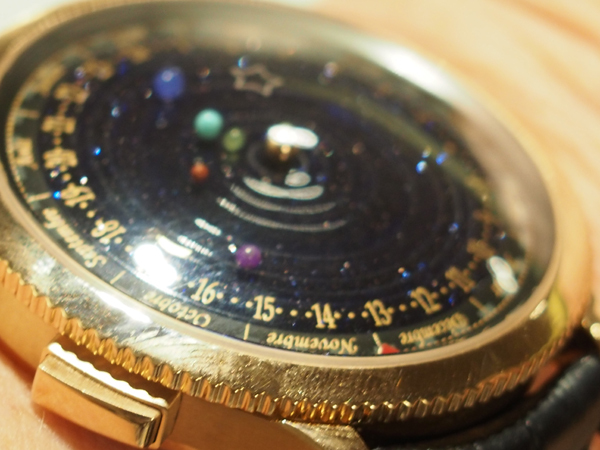 We love this timepiece and even though it could cost the price of a small house—you get the reality of the solar system on your wrist! The only thing is, since the rotation around the sun of the six three-dimensional planets depicted on this dial reflect reality, Saturn will only circle the dial once every 29 years! Patience is a virtue here. VanCleef & Arpels is no stranger to trying to tame the heavens and bring them to wrist proportions. 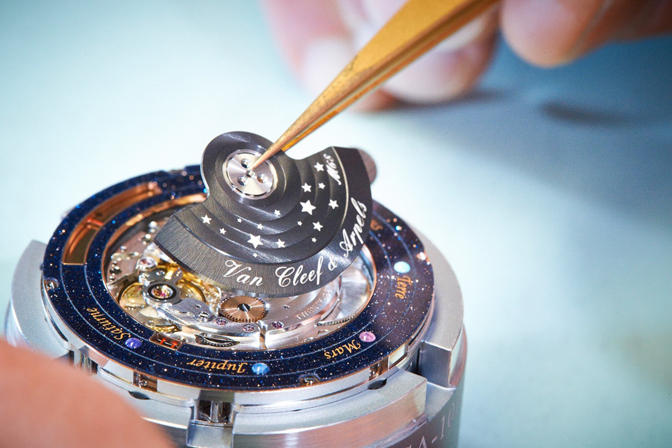 This brand embarked on the project a decade ago, and has unveiled such astronomical beauties as the Lady Arpels Day Night and the Midnight in Paris, among others, in its Poetic Astronomy line. 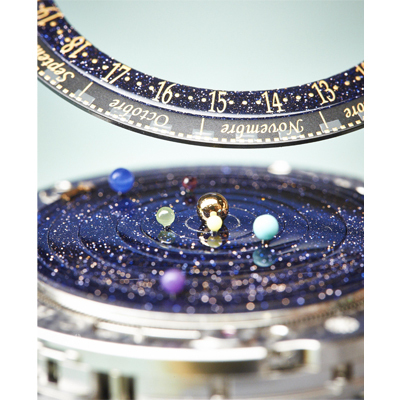 Now, the brand unveils the Midnight Planetarium watch – with a stunning aventurine dial and a three-dimensional solar system. To create this astonishing Poetic Complication watch, the brand turned to the master of astronomical timepieces – Christiaan van der Klaauw (whom we wrote about here yesterday). 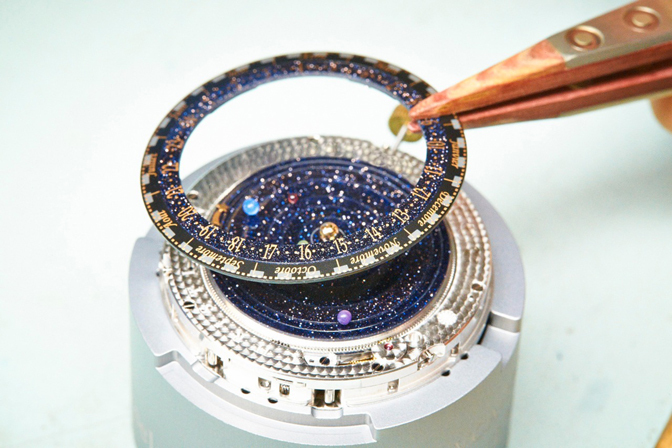 With van der Klaauw, Van Cleef & Arpels created the highly complex 396-part self-winding movement with a dedicated planetarium module that moves s each planet in real-time rotation. 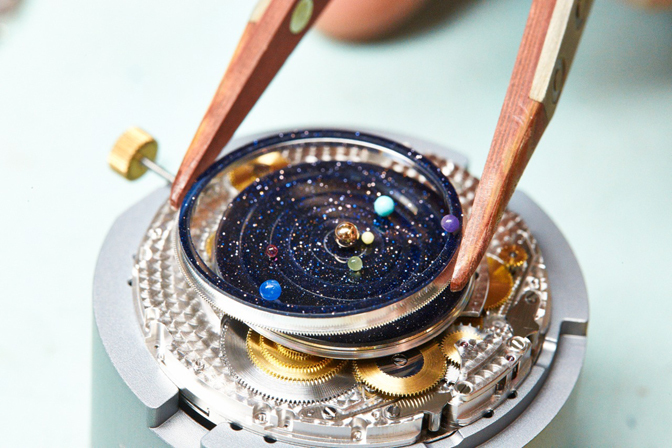 The watch features six miniaturized planets arranged around the sun in their correct line up: Earth, Mercury, Venus, Mars, Jupiter and Saturn. Not only is the positioning of the planets correct, but also, the rotation of them around the sun (the dial) is accurate, as well. While Saturn will rotate only once in a little over 29 years, Jupiter will take nearly 12 years, Mars will rotate in 687 days (just under two years), Earth in 365 days, Mercury rotates the dial every 224 days and Venus will rotate every 88 days. The stunning Extraordinary Dial™ of the captivating watch is aventurine and each of the planets is created using a precious stone: Earth is turquoise, Mercury is serpentine, Venus is chloromelanite, Mars is red jasper, Jupiter is blue agate and Saturn is stunning sugilite. The sun is created in 18-karat gold. Each element is fixed on its own aventurine disk and then set into concentric alignment. The watch was three years in the making. Reading the time on this beauty is simple: a shooting star on the periphery marks it for you. Located at the outer edge of the dial, the star completes its circuit in 24 hours. The day, monthand year can be viewed through two apertures on the dial, and through the transparent sapphire caseback, one can view the stunning rotor- embellished with stars. There is also a tiny extra surprise (typical of Van Cleef & Arpels), using a rotating bezel, the wearer can select a special lucky day by positing a red triangle against a graduated calendar, and on that day, the Earth will move to position directly below the star engraved on the sapphire crystal. Even the rotor has stars on it. This dream come true, created in a numbered edition, could be yours for the price of $245,000, or with a bezel set with baguette-cut diamonds for $330,000. Watch the video below, and reach for the stars.